This is a nice appetizer to serve your guests for Thanksgiving or anytime you entertain. 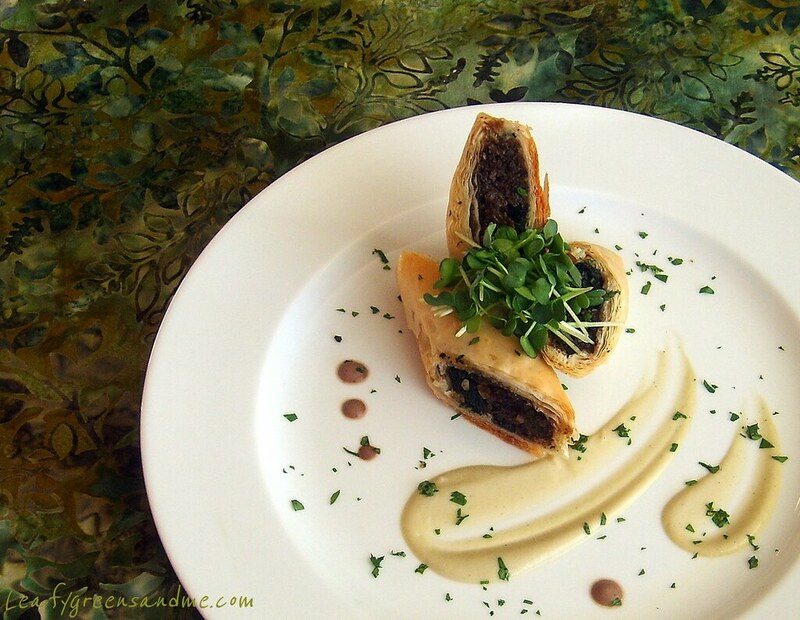 During the summer I make this with a Spanakopita filling and serve it with Tzazaki, but decided that a mushroom duxelles would be more appropriate for fall. I served these with a cabernet sauvignon mushroom sauce, but a simple lemon aioli or porcini aioli would work just as well. 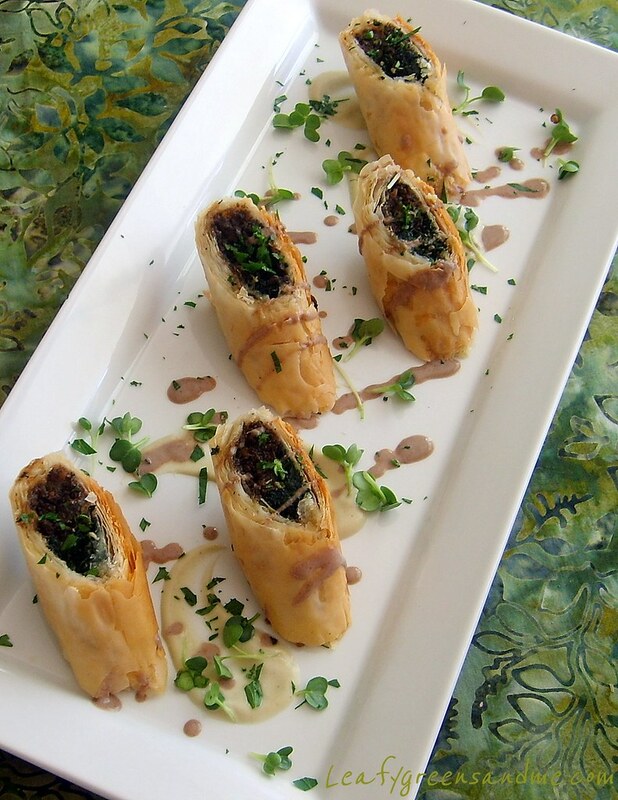 Also, you can shape the phyllo pastry into mini triangles or cigar shapes for a different presentation. Place sliced mushrooms in a food processor and pulse until finely minced, be careful not to puree them. Heat a large saute pan on medium heat, add olive oil and diced onions and cook for about 10 minutes until onions are soft. Add minced mushrooms, garlic, thyme and salt and pepper to taste and cook mushrooms until all the liquid is absorbed, stirring frequently. This takes about 30 minutes. Deglaze the pan with Maderia wine and cook for about another 30 minutes, stirring frequently until all liquid is absorbed and the mushroom mixture is sticking to the bottom of the pan. Check for seasonings, remove from heat and cool to room temperature. Heat a large saute pan to medium-low, add olive oil and garlic and cook garlic for a couple of minutes until it starts to sizzle, stirring and making sure that it doesn't burn. Immediately add chopped spinach (you may not be able to add all of it at once until it cooks down), and salt and pepper and cook for about 3-4 minutes, stirring frequently. Remove from pan and strain away liquid, pressing with the back of a spoon or spatula to remove excess liquid. Wrap spinach in a dish towel and squeeze to remove any remaining liquid. Place spinach on a cutting board and chop finely. Cool to room temperature and set aside. Whisk butter and oil together in a small bowl. Remove phyllo from package and unroll. While working with phyllo, keep it covered with plastic wrap and a damp towel so that it doesn't dry out. Working with one sheet at a time with the longest edge facing you, brush the entire surface lightly with the butter/oil mixture. Repeat this process for a total of 4 sheets. Divide the duxelles mixture in half and place mixture evenly along the bottom edge leaving about 1/2" boarder along the bottom and a 1" along the sides. 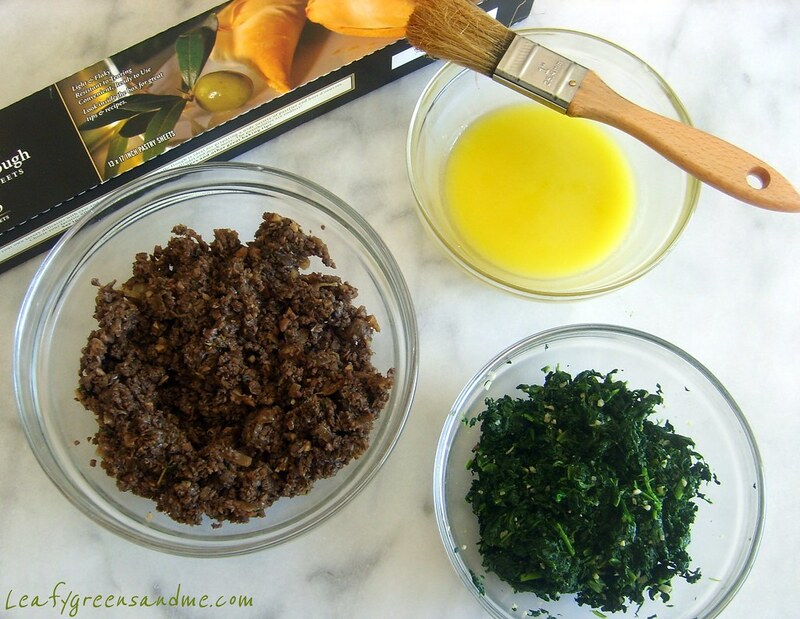 Divide spinach mixture in half and place on top of the duxelles mixture. Carefully lift the bottom edge and roll the phyllo into a smooth log, brushing lightly with more butter mixture, until all the phyllo is wrapped. Score the phyllo lightly on a bias at 1-1/2 - 2" intervals. You should have about 9 pieces per log. 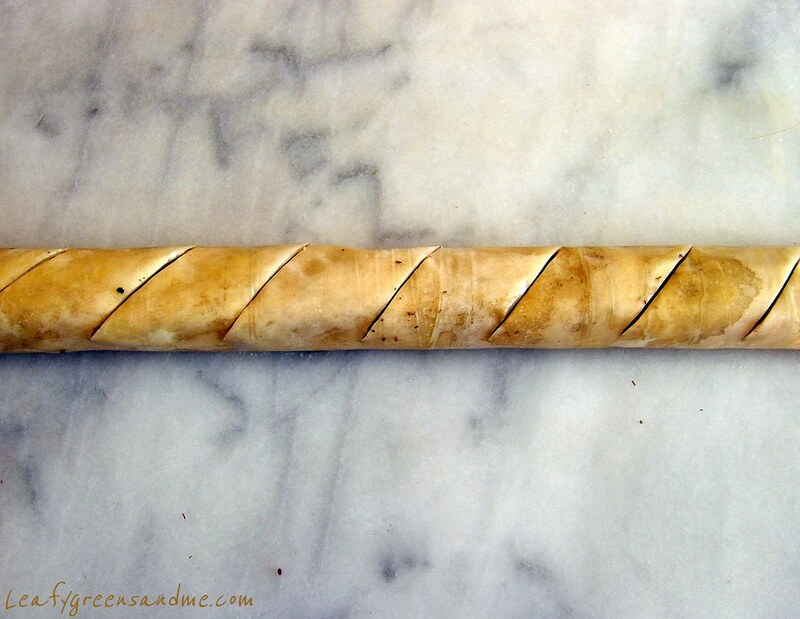 Place strudel logs on two separate sheet trays covered with parchment or silpats. Bake in the oven for 16-20 minutes (depending on oven), turning/rotating trays half way through the cooking process until puffy and lightly golden brown.